Nancy Lynn Jarvis describes herself as observant, political, opinionated, droll, and resilient. Her writing is fun, light, clever, and involves cozy mysteries. My guests are Agatha Christie because she introduced me to mysteries and wrote honestly, giving readers all the clues they need to solve the crime which I do as well; Queen Elizabeth I because she was a survivor who fascinates me; and Amy Tan because she is my favorite living author (although I have to tell her that her last book needed cutting) because we are eating Chinese food, my favorite, in San Francisco where she lives. I’m a method writer who frequently acts out her story as she writes it so my office should be my most productive venue, however, I sort things out best while gardening, driving — yes, I know distracted driving is dangerous — and cooking, especially something like risotto that requires standing and stirring. My mind works in flashes often when I’m not trying to focus too hard. Mornings are definitely my best writing time. I don’t know if you count drinking strong black tea as needing caffeine, but my teacup, often filled with cold neglected tea, is my constant companion when I write. I don’t have a typical reading month. I may not read anything in a month when I’m writing, or I may not sleep much for a month because I’m reading late into the night every night. My most recent favorite book is “The Scottish Movie.” It begins with Shakespeare stealing the plot of Macbeth and the young cheated playwright causing the play’s curse. The book then switches to modern Hollywood where the Scottish Movie is being made, again with stolen material. The swindled writer works similar, if less deadly, mischief during the making of the movie. I write because it’s so darned much fun. Since starting this latest adventure, I’ve had people tell me they enjoyed my books, been able to do speaking gigs where I get to talk about them, and best of all, made friends with writers from all over the globe. My husband and I were even able to edit a cookbook called “Cozy Food: 128 Cozy Mystery Writers Share Their Favorite Recipes” because of the wonderful connections I’ve made. 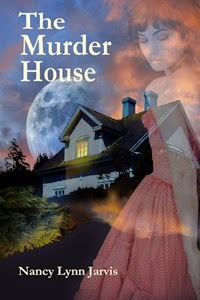 Like all the mysteries I’ve written, the idea for “The Murder House” landed in my head one day. I was a Realtor for twenty-five years and have many experiences and stories to incorporate into books. My protagonist, Regan McHenry is a Realtor/amateur sleuth who gets dragged into solving mysteries because of clients, associates, and her job. I already mentioned Agatha Christie. My grandmother encouraged me to read her as a precocious pre-teen reader because I thought Nancy Drew books were boring and silly. Dame Agatha gave me a love of the logic of mysteries … and tea drinking in the English countryside. Tony Hillerman gets credit for causing me to set my mysteries in Santa Cruz and use a real estate agent for my protagonist. His twenty-one books — reading all of them was one of my reading jags — inspired me to write in a setting as familiar to me as the Big Reservation was to him and to use the culture and jargon of a group of people I knew well as my Navajo equivalent. The slightly different outlook and morality many of my characters hold comes from me. None of you have heard of my third writer because Charlotte Bridges never finished writing any of her novels. Charlotte was a friend who caught me working on my first mystery and told me I couldn’t just decide to write. She said I had to follow the critical advice of a writing circle, a mentor, and teachers like she always did before I could write a story. Because Charlotte did what she told me to do, she never finished anything she started, which is a shame because she wrote beautifully. Charlotte was diagnosed with terminal brain cancer shortly after I finished my first book— a book I wrote as an intellectual exercise and never intended to let anyone read — and said her one regret in life was never having seen her name in print. “The Death Contingency” was dedicated to her and published in a hurry so she could have her final wish. That beginning has made all the difference in my life. The best advice I received as a writer was, “edit, edit, edit, then get professional editing.” I edit like crazy. Next I have a pro work on the book. Finally I have a professional copy editor go over the book. The difference between where the book seems fine to me and the final product is staggering. FYI, if you find errors in this blog, it’s because I attempted to self-edit it. Thanks for sharing Charlotte's story as well as your own. I'm also a huge fan of Amy Tan, and agree on your assessment of The Valley of Amazement. She worked on the research for so many years, and I suppose she had a hard time leaving some of it out. Another lesson for us writers! Yes and to Nancy's point about all authors need outside editing. I've noticed that really BIG NAME authors often end up with bloated books because the editors bow to the genius rather than remembering without the editor in the early works the author probably wouldn't have reached that BIG NAME status. That is so true, Jim. Nancy, your book sounds quite interesting. I'm putting it on my TBO list.